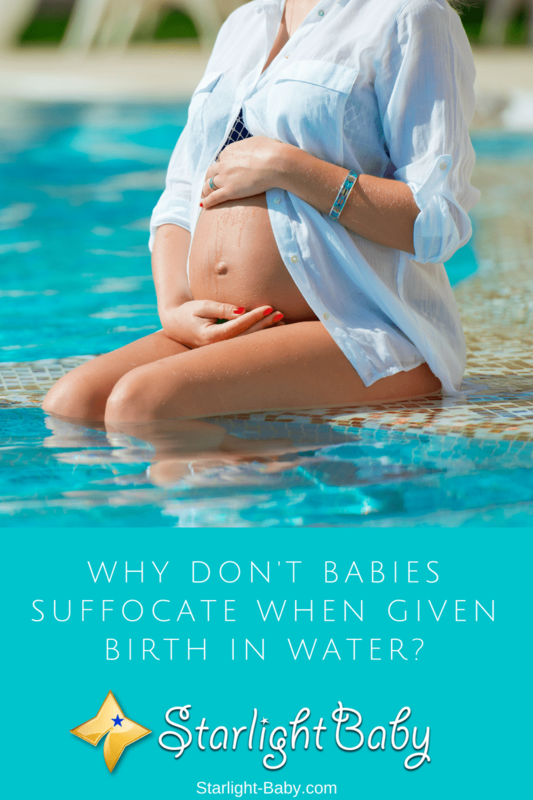 Why Don’t Babies Suffocate When Given Birth In Water? Water birth is a conventional practice in normal delivery that is getting more popular nowadays. If you search social media, you can browse through several write-ups and videos regarding this modern technique of giving birth. It has been said that expectant moms tend to have less pain and easier delivery when they are submerged in a pool full of water. How Do These Little Experts Breathe Underwater? Fact #1: They will not breathe. Yes, your baby will not be breathing until he is lifted out of the birthing pool. Isn’t it amazing that your baby knows he is still in an aquatic environment? This has something to do with a baby’s reflexes towards his surroundings. Inside the womb, our baby floats inside a sac filled with amniotic fluid and doesn’t breathe either. So where does their oxygen supply come from? It comes from the maternal blood supply. The oxygen from the mom’s blood travel through the placenta; it then reaches the baby via the umbilical cord. After delivery, the umbilical cord is still attached to the placenta. Birthing professionals who have experienced assisting in water births testify that they can see the cord pulsating for up to an hour after the placenta is cut. The placenta serves as a reservoir of maternal blood (which has oxygen content) in a short period of time after giving birth, thus nourishing the newly delivered baby (who is still underwater) with oxygen until he takes his first breath in the atmosphere. Fact #2: The regulated temperature hinders them to use their lung function. During water births, the professional assisting in the delivery needs to check and regulate the water temperature all throughout the birthing process. Experts say that the temperature in the birthing pool should not exceed 98 degrees Fahrenheit/36-37 degrees Celsius. As we can see, this range is almost the same to the normal temperature of our body. Due to this temperature regulation, the baby’s system won’t notice that he is already outside the mother’s womb. Thus, the baby is kept at a state where she still needs to use the maternal blood to get oxygen. The moment the baby is lifted out of the pool, they would instantly feel the drop in the temperature of his surroundings. This will trigger the baby’s reflex to use his lungs to breathe instead. Hence, she’ll only have his first breath on the atmospheric environment. Fact #3: Babies are “skilled divers”. How about the risk for aspiration? Can the water get through his nose and lungs? Babies have had nine months of training and experience floating in water inside the womb, so don’t worry since the risk would be very low. A baby knows that when they open their mouth, they would have to drink fluid rather than inhale it. This infant reflex continues until later when she is fed with milk. She will know that fluids need to be swallowed and will prevent her from inhaling it instead. Your Childbirth Options – Which One Is Right For You? Can Babies Smile From Birth? During Labor, Why Are Ice Chips Given Instead Of Water? That is correct! Babies really thought that they are still in their mother’s womb. It is also amazing that you take the babies to learn swimming as infants they are better than adults. they have control of their bodies. God is really amazing with His creations! That is why even some great scientist of the human body can’t unlock most secrets of the human anatomy. You should remember that it’s not just any pool that a pregnant mother can make use of in giving birth. There are certain requirements that the pool must have to make it a condusive environment for the baby to born in without putting the child’s health at risk the moment it comes out. The temperature of the pool must be in the same frame of the human body temperature in order for the baby to still feel comfortable when out in the pool before being taken out. This is a very informative article on baby birth in pool of water, I really can’t stop laughing on the 3rd tip which labeled babies as skilled divers. It’s very funny for the term used but in actual sense, it’s absolutely true because being in the belly for 9 months can make anyone a perfect diver.